A smaller-than-usual digital that sounds and feels good and won't break the bank. Good keyboard action, impressively small footprint, useful 'record' facility for practice. Must be used with keyboard stand, speaker position is not ideal, slim dimensions don't equate to light weight. Acoustic pianos are wonderful instruments, but they are not always practical. They're fearsomely heavy, require regular tuning and servicing and, short of being recorded, they offer limited compatibility with technologically-equipped studios. If you're looking for a piano sound and touch without the hassle of maintenance, but with tech compatibility, you need a digital piano. 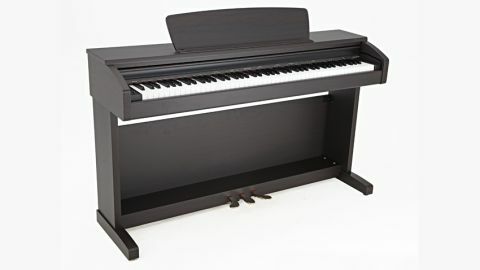 If your piano has to fit into a limited space is, the MLP200L model, from the Minster slim range, may be worth investigating. The MLP200L comes in a single box containing the instrument itself and its stand. The lowest section of this houses its pedalboard. Assembly is straightforward, but despite its slimline dimensions, the instrument is still heavy enough that two pairs of hands are required to fix it all together. As with Minster's larger digital pianos, the stand must be used. With the slimline range, this is partly because the stand incorporates the speaker box from which the sound is produced. This means the speakers are not located in an ideal listening position. The 'slim' tag refers to the MLP200L's front-to-back depth, which is impressively compact. Smaller dimensions mean limited space, however. As a result, the keyboard's options buttons are housed to the left of the keyboard, rather than the more conventional behind-the-keys location. Some functions, including sound selection, are accessed via a combination of a button on the left and the keyboard's keys themselves. To change the internal voice, for example, press Setup and select one of the instruments listed on the keyboard's lowest two octaves. In a similar way, it's possible to activate and edit a range of additional options. These include keyboard splits and layering, internal effects, keyboard transpositions and more besides. One instantly pleasing function on the MLP200L is a basic record/playback capability. This is a great practice tool: play and record a piece, then listen back to it with some objectivity. You'll be surprised at the details of your playing that present themselves to you. You can identify sections that need attention, or indeed parts that you're playing particularly well. Then repeat the same process after you've done a bit of practice and see how you've improved. There are 12 main voices, two split voices (where the keyboard is divided to accommodate two zoned sounds), three layered voices (where two sounds play at once across the keyboard range) and 14 extra sounds, which are assigned to the white keys between the main sound types listed above. There are a few compromises with the MLP200L. It only has 64-note polyphony (this is the number of notes it can sound simultaneously. Some digital pianos have 128-note polyphony. ), it has a smaller number of onboard sounds compared to its big brothers and fewer internal effects options. All in all, though, this slimline digital is an attractive option. The key action is as pleasing as Minster's larger digital pianos and has four levels of touch sensitivity. This is sure to appeal to piano purists who are looking for a realistic touch. The fact that it's able to 'talk' to a vast range of studio equipment, including keyboards, computers, sound modules and more, via MIDI and USB connections, makes it an attractive option for a studio setting, too. Plus it won't break the bank. So, if you're looking for a technology-ready piano to fit into a small space and deliver an authentic piano experience, check this out.